The Management Configuration provides the ability to set who the manager is for which staff. This allows Microkeeper to notify the correct individuals when required. A Organisation Chart can also be built from the Primary Manager data. The Direct Manager can be nominated for different notification needs in Microkeeper. Setting a Direct Manager is optional. If the Direct Manager is not set the Primary Manager will be used. An unlimited number of Direct Managers can be set for an event. If a Direct Manager is selected the Primary Manager will not get an email notification unless they are also set as the Direct Manager. The Primary Manager is the employee's default manager if a Direct Manager is not configured. Microkeeper recommends setting a Primary Manager so there is always a main single point of contact if an Employee has any questions. The Primary Manager is also used to build an Organisation Chart. Only one Primary Manager can be set per employee. To edit a Primary Manager click the Blue Edit button. To edit a Direct Manager click the Grey Plus buttons. 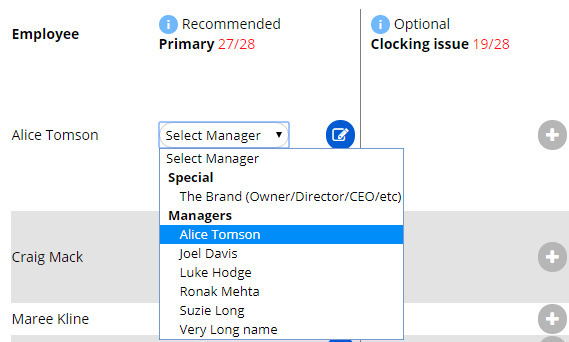 Select the manager from the drop-down list. Note: The Counter at the top will help check that all Primary Managers have been set. Selecting a Primary Manager is used to build an Organisation Chart. The Brand (your company eg. Bob's Plumbing) can be selected for users that do not have a Primary Manager. For example Owners, Directors, CEO etc. At least one user must be selected as The Brand, else building the Org Chart would not be possible. Microkeeper would recommend selecting a Direct Manager if required. Example, if the CEO requests Annual leave, a Message to Payroll manager might be required. If no email notification is required to be sent for an event, Skip notification can be selected for the Direct Manager. You can search for an employee by Group, Status, Timezone, etc. This feature can be used in conjunction as a Bulk Actions, for example, to Apply a manager to a Group of staff. A bulk action can be used to apply an action to multiple staff at once. Add can be used to add the payroll officer to manage Message to Payroll. Replace could be used if a manager is terminated and a new manager is taking over their role. Switch could be used if two managers are changing roles. Use the blue info dots to learn more about these options.